Last month, ARDEX joined ISPE at the Walton Park Hotel in Clevedon for their 120th One-Day Seminar, where Shaun Howarth, National Business Development Manager, and Vince Ruffini, Contract Manager, presented and demonstrated ARDEX’s solutions for waterproofing water retaining structures. In swimming pools, it’s not just waterproofing that presents challenges to installers. Ultimately, it is the choice of tiles, combined with the correct suite of preparation products, tile adhesives and grouts, that allows you to not only create an aesthetically pleasing design, but one which is also durable and will withstand the most demanding conditions for years to come. 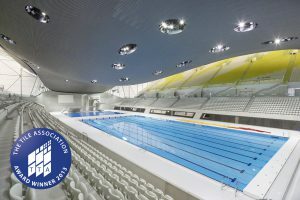 ARDEX products have been successfully specified in hundreds of swimming pools, from domestic projects to the London Aquatics Centre for the London 2012 Olympic games. In this article, we’ll take you through our top tips for tiling in pools, and how you can get a long-lasting, durable finish. As with any project, preparation is key. The first step in any pool tiling installation is to evaluate the substrate and ensure it is flat enough to receive the tiles. According to British Standards, any deviations should not exceed 3mm when measured under a 2m straight edge. To be confident you’re starting with a flat, smooth surface, you should render the walls and screed the base. This stage will also allow you to create ramps and falls if needed and adjust the inside measurements of the pool to match the exact length and depth required; this is particularly important in competition pools, which must be made within very strict tolerances. A problem we sometimes see at this stage is that the screed or render hasn’t been able to create an adequate bond to the substrate, which is usually caused by poor preparation of the substrate. Make sure you avoid this by using appropriate mechanised surface preparation equipment to remove any loose, friable materials, and ensuring proper application of the screed or render. ARDEX AM 100 Rapid Set One Coat Tile Render: apply 2-30mm thick on walls and tile in as little as 2 hours. ARDEX A 38 Ultra Rapid Drying Cement for Internal & External Screeds: apply bonded 15-40mm thick on floors and tile in as little as 4 hours. ARDEX S 21 Rapid Setting Floor Tile Bedding Mortar: make ramps from 3-30mm thick and tile in as little as 3 hours. ARDEX K 301 Self-Smoothing Levelling Compound: apply 2-20mm thick on floors and tile the next day. Swimming pools are required by British Standards to be watertight structures. If not, it is essential that a waterproofing product is used and applied over the entire area and at the correct thickness, otherwise there could be leaks, which are notoriously hard to find after the full installation is complete. It is also important to use the correct reinforcement tape beforehand, and this should be applied to all the joints between walls and floors, and any inlets to the pool. ARDEX S 7 PLUS Flexible Waterproof Coating for Swimming Pools: apply 2 coats and install tiles just 4 hours after the application of the second coat. ARDEX WPM 200 Epoxide Liquid Waterproof Membrane: resistant to chemicals and the effects of moving water, and ideal for swimming pool drainage channels, plant rooms and balance tanks that do not require tiling. Fibre reinforced for enhanced adhesion and flexibility. A 3-hour pot life and 60-minute open time allow more adhesive to be mixed and spread in a single batch, providing greater fixing efficiency over larger areas. Up to 19m² coverage from a single bag when fixing mosaics. Once you begin tiling, it is essential that solid bed fixing is achieved and that no voids are left beneath the tiles. What About Tiling to Fibreglass Pool Shells? Fibreglass (GRP) shells are a particularly common occurrence for swimming pool contractors and is often the tiling background in pools and jacuzzies. This presents a challenge for fixers as traditional cement-based adhesives are unable to fix to them. In 2018, ARDEX launched ARDEX X 60 PU FLEX Polyurethane Reaction Resin Tile Adhesive; specifically designed to adhere to problematic substrates, it can be used to fix tiles to fibreglass, steel and PVC direct without priming! The most common problem we see at this stage is where the incorrect type of grout is selected and inevitably degrades and/or falls out of the joints. It is important to distinguish between the two main types of grout. Firstly, there are cement based grouts, which can be used in fully submerged areas and where the pool water is balanced. For areas of moving water, around the pool edge for example, or in outdoor or salt water pools, you should always look to use an epoxy/reaction resin grout. These grouts offer excellent chemical resistance and high standards of hygiene and cleanliness but can be difficult to use; opt for ARDEX EG 8 PLUS for the best of both worlds. ARDEX-FLEX Flexible Tile Grouts: cementitious grouts with built-in admix that are water repellent, dirt resistant and available in 35 colours. Select ARDEX-FLEX FS for joint widths up to 4mm wide and ARDEX-FLEX FL for joint widths 3-15mm wide. ARDEX EG 8 PLUS Easy Apply & Clean Epoxy Tile Grout: combines the chemical resistance of epoxy grouts with the ease of application of cement-based grouts. Requires no special tools and can be cleaned off the surface up to 60 minutes after application. ARDEX are a premium supplier of products for the preparation and installation of tiles in swimming pools. For more information on the full range of ARDEX products suitable for use in and around swimming pools, download our brochure here.